The cold pressor test is a classic stress induction task used in a wide range of research examining the relationship between stress and cognition, emotion, and behavior. In this article, a practical and versatile alternative to the traditional cold pressor test is presented: the cold pressor arm wrap. Porcelli, A. J. An Alternative to the Traditional Cold Pressor Test: The Cold Pressor Arm Wrap. J. Vis. Exp. (83), e50849, doi:10.3791/50849 (2014). Recently research on the relationship between stress and cognition, emotion, and behavior has greatly increased. These advances have yielded insights into important questions ranging from the nature of stress' influence on addiction1 to the role of stress in neural changes associated with alterations in decision-making2,3. As topics being examined by the field evolve, however, so too must the methodologies involved. In this article a practical and effective alternative to a classic stress induction technique, the cold pressor test (CPT), is presented: the cold pressor arm wrap (CPAW). CPT typically involves immersion of a participant's dominant hand in ice-cold water for a period of time4. The technique is associated with robust activation of the sympatho-adrenomedullary (SAM) axis (and release of catecholamines; e.g. adrenaline and noradrenaline) and mild-to-moderate activation of the hypothalamic-pituitary-adrenal (HPA) axis with associated glucocorticoid (e.g. cortisol) release. While CPT has been used in a wide range of studies, it can be impractical to apply in some research environments. For example use of water during, rather than prior to, magnetic resonance imaging (MRI) has the potential to damage sensitive and expensive equipment or interfere with acquisition of MRI signal. The CPAW is a practical and effective alternative to the traditional CPT. Composed of a versatile list of inexpensive and easily acquired components, CPAW makes use of MRI-safe gelpacs cooled to a temperature similar to CPT rather than actual water. Importantly CPAW is associated with levels of SAM and HPA activation comparable to CPT, and can easily be applied in a variety of research contexts. While it is important to maintain specific safety protocols when using the technique, these are easy to implement if planned for. Creation and use of the CPAW will be discussed. Stress exposure is associated with activation of two stress-responsive biological systems: the hypothalamic-pituitary-adrenal (HPA) and sympatho-adrenomedullary (SAM) axes5. When stress is of sufficient intensity to disrupt an organism's homeostatic balance, SAM quickly triggers increased activity in the sympathetic branch of the autonomic nervous system (ANS). This is associated with release of catecholamines (e.g. adrenaline and noradrenaline; CA) from the adrenal medulla and sympathetic nerve terminals. Increased levels of these excitatory chemicals are associated with elevations in heart rate and blood pressure that characterize the classic "fight-or-flight" response6. Although subsequent activation of the parasympathetic ANS will eventually inhibit this excitation, ascending CA neurons interfacing with brainstem structures contribute to slower HPA activation via the hypothalamus and eventual glucocorticoid (i.e. cortisol in humans) release from the adrenal cortex7. Understanding the relationship between stress modality and the specific dynamics of the stress response itself will be critical as research on the relationship between stress and the neural correlates of various psychological processes (e.g. memory, learning, and decision-making) advances. Multiple stress induction tasks have been developed for use in laboratory research. Generally, these can be classified as systemic (i.e. representing a reflexive response to a direct threat to homeostatic balance) or processive/psychogenic (i.e. requiring forebrain processing and appraisal prior to engagement of the stress response)8. Notably, these two distinct stress modalities Fare associated with differential patterns of SAM and HPA activation. The cold pressor test (CPT) is a common and well-validated means of inducing systemic stress involving immersion of an individual's dominant hand in ice water (typically between 0-5 °C) for a period of time4,9,10. CPT has been used in a wide range of research examining the influence of stress on memory11-13, learning14, and decision-making15-17. Studies using CPT as a means of stress induction have, however, yielded mixed results in terms of cortisol reactivity. Overall mild-to-moderate cortisol increases have been observed post-CPT13,18,19, though SAM activation is robust and reliable4,20. In contrast, processive laboratory stressors such as the Trier Social Stress Task (TSST)21,22, during which participants give a 5 min speech followed by 5 min of mental arithmetic while being watched and/or videotaped, have been associated with two- to three-fold increases in cortisol23. To maximize both SAM and HPA activation, some researchers have taken the approach of combining CPT with social evaluative components similar to those present in the TSST. For example, in the socially evaluated cold pressor test (SECPT) participants are asked to perform a traditional CPT while being video-taped and watched by an experimenter24. Similarly, the Maastricht Acute Stress Test integrates SECPT with public speaking and mental arithmetic components of the TSST25. While these approaches represent a significant step forward in stress research it remains important to examine the specific, and potentially dissociable, influence of SAM and HPA activation on the neural correlates of behavior, cognition, and emotion. Unfortunately CPT, involving water, is often impractical to perform in studies involving magnetic resonance imaging (MRI) unless completed prior to entry into the MRI itself. For example, spilled water can be a threat to sensitive and expensive MRI equipment (e.g. the head coil) and can interfere with MRI signal due to its high proton density26. Thus, as research involving CPT expands towards use in neuroimaging contexts modifications to the traditional CPT procedure are necessary. To that end, an alternative is proposed - the cold pressor arm wrap (CPAW). Rather than hand immersion in ice-cold water, the CPAW involves an arm wrap composed of MRI-safe gelpacs cooled to a temperature similar to the traditional CPT. It can be attached to the forearm and hand of a participant, and is easily removed at their request. Further, CPAW is versatile in its composition from a simple collection of common components. It is important to note that additional safety concerns exist in CPAW use, as it can potentially be cooled to a temperature much lower than liquid water. That said, these can be accounted for with minimal effort on the part of the researcher. Proper storage and use of the CPAW will be demonstrated with special attention paid to safety protocols. Note: the CPAW is versatile in its components and construction. While this protocol represents the approach taken by the author, alternative approaches are possible. Affix two to three pieces of Velcro (each about 4 in x 1 in) to each of the two gelpacs (6 in x 12 in size) using rubber cement, equally spaced. Allow 24 hr to dry. Obtain a piece of thick fabric approximately 12 in x 16 in in size, fold in half lengthwise. The example 6 in x 12 in gelpacs will run lengthwise along each inner half of the folded fabric. Affix the complementary side of each Velcro piece (from step 1.1) to the inner sides of the fabric, spaced so that they will match placement of the Velcro on the gelpacs. Rubber cement or needle and thread may be used. This will allow gelpacs to be easily removed for cleaning and reattached for storage. Obtain two larger pieces of Velcro (approximately 2 in x 10 in). Separate. Cut one side to about a quarter of its original size (and discard the remainder) while keeping the other at the original 2 in x 10 in size. Affix the small piece of Velcro to the front and back of the outer portion of the fabric on the same side. Finally, affix the longer part of the Velcro to the analogous locations on the outer portion of the opposite side of the fabric. After this is completed, it should be possible to wrap the fabric around one's forearm and hand and fasten it in place using the Velcro straps. Inform participants in studies using CPAW multiple times, during consent and prior to CPAW administration, that they are free to withdraw and end the procedure at any time. Three discrete withdrawal statements are recommended. Additionally, be prepared to end the procedure if the participant becomes distressed. Example Instructional Text: "In this study, we may ask you to participate in a stress procedure that involves placing an arm wrap made of cold gelpacs to your arm for a period of time. The wrap is designed to be stressful, and will thus be highly uncomfortable. It is important that you understand that it is your right to end the procedure and experiment at any time for any reason, whether the arm wrap is currently on your arm or not. To do this once in the MRI you may tell me verbally, you may kick your foot vigorously, or if necessary you may use the emergency squeeze-ball we will give you. Do you understand? Are you willing to continue?". Thereafter, it is advised that the participant be reminded twice more before MRI scanning with the statement, "Remember, we will remove the arm wrap and end the experiment at your request at any time". Store CPAW in a freezer with a carefully monitored temperature. If the freezer cannot beset to a specific temperature (e.g. between 0-5 °C) and is below 0 °C, allow time for CPAW to warm to a safe temperature (no less than 0 °C) after removing it from storage. Otherwise, the potential exists for a participant to experience a cold burn. Prior to employing CPAW, cover the gelpacs with a layer of plastic sheeting to avoid direct contact between gelpacs and the participant's skin. Measure the surface temperature of each gelpac (covered by the plastic sheeting) using an infrared thermometer in two-to-three locations along its length to ensure a safe temperature. If the temperature is too low, allow additional time to pass and measure again. When the desired temperature is reached, wrap CPAW around the participants forearm and hand affixing it in place with the aforementioned Velcro straps. Leave CPAW in place for the desired period of time (2 min is recommended). Remove it immediately upon the participant's request or after that time has elapsed. CPAW has been used in a previously published study examining the influence of acute stress on neural reward processing while participants underwent functional MRI scanning27. Thirty-two participants (16 females, 16 males; mean age = 23.41 years, SD years = 4.07) were randomly assigned between-subjects to a CPAW or no stress control group (an arm wrap composed of towels at room temperature). A baseline salivary cortisol sample was acquired at the beginning of the protocol followed by CPAW (or no stress control) application for 2 min, after which a 10 min behavioral task was performed. After the first behavioral task, this pattern repeated - a second saliva sample was acquired, followed by CPAW (or no stress control) for 2 min, and a second 10 min behavioral task. A third saliva sample was acquired after the second behavioral task. In a post-experimental questionnaire, participants were asked to report subjective ratings of perceived stress, including how the arm wrap made them feel (good to bad) and how stressful the experience was (high to low) on a 7-point Likert scale. 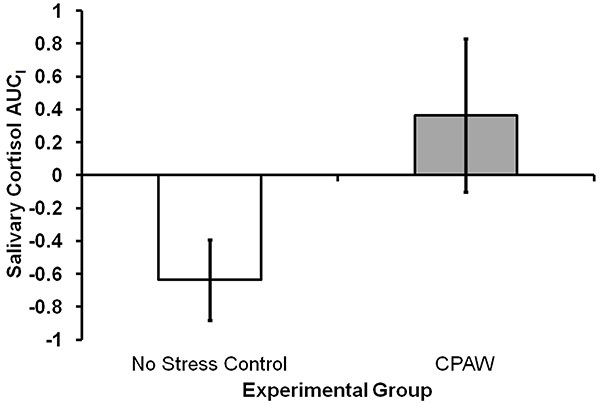 Compared to the no stress group, participants who experienced CPAW reported the arm wrap as feeling significantly more stressful, t(30) = 3.46, p< 0.01, d = 1.22, and as feeling significantly worse, t(30) = 4.42, p< 0.001, d = 1.56. Three participants were excluded from salivary cortisol analysis, one due to corrupted samples and two due to an inability to collect samples during the experiment. Thus, final cortisol analyses were conducted on 29 of the 32 participants (13 no stress control, 16 CPAW). Area under the curve with respect to increase (AUCI)was calculated using the trapezoidal method for both groups (see Table 1 for mean salivary cortisol of each sample by experimental group in nmol/L)28. 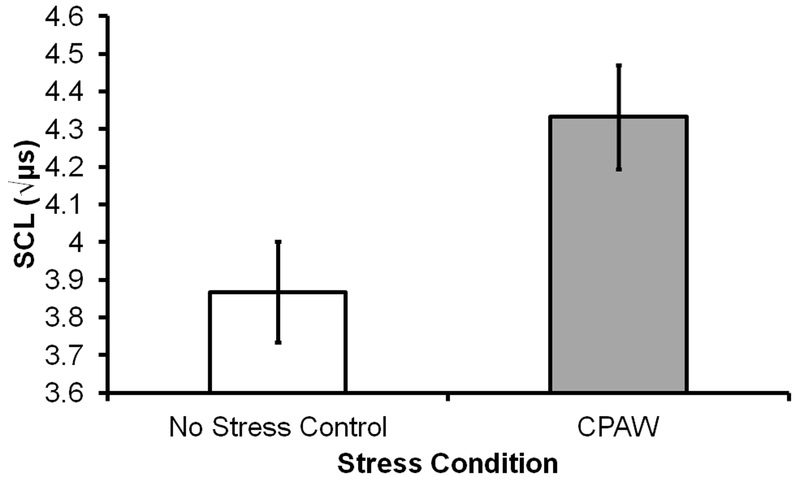 A one-tailed independent t-test between the no stress control and CPAW group AUCI indicated a significant increase in salivary cortisol for the CPAW group, t(27) = 1.78, p< 0.05, d = 0.69 (See Figure 1). Only two participants exhibited head motion in excess of one voxel (i.e. 3 mm),but both were in the no stress group. No participants withdrew from the study due to CPAW exposure. Preliminary analysis of an additional dataset provides convergent support for the efficacy of CPAW in terms of SAM activation (i.e. skin conductance)29. Twenty-eight participants (14 females, 14 males; mean age = 21.18 years, SD years = 2.97) performed a no stress control arm wrap (as above) for 2 min followed by a 15 min behavioral task. After this they performed the CPAW for 2 min, followed by a second 15 min behavioral task (all within-subjects). Skin conductance levels (SCL) were measured during each of the arm wrap exposures (no stress control then CPAW) using a BIOPAC module and analyzed using AcqKnowledge software. The average SCL waveform of each 2 min arm wrap was computed (in microsiemens, µs) and normalized using a square-root transform30. A paired t-test indicated significantly elevated SCL during CPAW exposure above the no stress control, t(27) = 5.49, p< .001, d = .65 (see Figure 2). Table 1. Mean salivary cortisol levels in nmol/L at baseline, after task run 1, and after task run 2 for CPAW and no stress control groups (Mean ± SEM). Adapted from Porcelli et al.27 with permission. Click here to view larger image. Figure 1. Salivary cortisol area under the curve with respect to increase (AUCI) for CPAW and no stress control groups. Negative AUCI values, which indicate a net decrease in salivary cortisol, were retained as an "index of decrease"28. Adapted from Porcelli et al.27 with permission. Click here to view larger image. Figure 2. Square-root transformed mean skin conductance levels (in microsiemens; µs) during CPAW or no stress control arm wrap. Click here to view larger image. In this article an alternative to the traditional cold pressor test was demonstrated - the cold pressor arm wrap. CPAW is a procedure that produces psychophysiological and neuroendocrine stress responses comparable to the CPT. Specifically, robust increases in SAM (i.e. sympathetic ANS) activation and mild-to-moderate increases in HPA (i.e. cortisol) activity were observed. CPAW can be created from a range of commonly found components, and serves as a viable alternative to the traditional (water-based) CPT. An additional advantage of CPAW is that it can be easily employed in research contexts where it could be impractical, even unfeasible, to use CPT (e.g. MRI). As mentioned previously, CPAW requires additional safety precautions beyond those associated with CPT. Exclusionary criteria (largely shared by CPT) should include: cold urticaria, Reynaud's Disease, aneurysm, pregnancy, history of cardiovascular illness, diabetes, chronic rheumatologic disease, and untreated blood pressure abnormalities. Given that CPAW can potentially be cooled to unsafe temperatures below that of liquid water, strict temperature measurement prior to application is critical to avoid risk of participant injury. As the apparatus is physically fastened to the participant's arm it is vital that it be made clear at several points that they can end the procedure at any time at their request. Further, the experimenter must be prepared to terminate the procedure if the participant becomes distressed. Thus, the procedure requires that the researcher be vigilant on multiple fronts. Several limitations exist in use of CPAW. For example, in the context of MRI studies a short-bore MRI may be necessary as fastening CPAW to a participants arm might not be possible in a long-bore MRI. That said, adapting CPAW for use on a foot or leg is feasible and would be compatible with a long-bore setup. Titration of CPAW temperature to a highly precise temperature is also difficult. Research indicates that deviations of even 2 °C are associated with variations in tolerance time and pain ratings31. To avoid this, use of a freezer that can be cooled to a specific temperature is advised. Additionally, it is advised to have a second CPAW available if the device will be employed multiple times in close succession (to avoid it being warmed beyond the desired temperature). Though in the representative results CPAW use was not associated with increases in head motion, researchers should pay special attention to head movement in the fMRI setting - especially if CPAW is being applied during (rather than prior to) fMRI scanning. 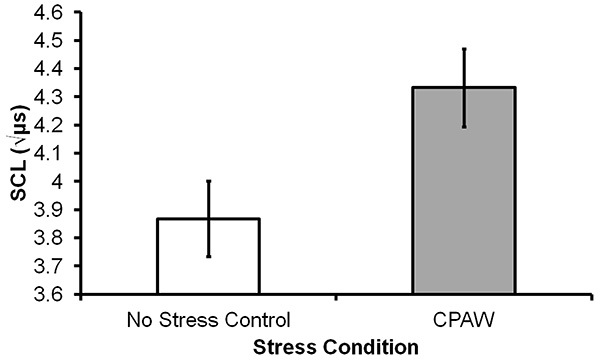 While subjective stress ratings, HPA, and SAM activation suggest that CPAW is an effective stressor comparable to the traditional CPT, future research should focus on careful comparison of the extent of HPA and SAM activity with that evoked by the traditional CPT as well as other physiological indices (e.g. heart rate and blood pressure). 2 Cryo-Max Cold Packs (6 in x 12 in) Modular Thermal Technologies n/a This is an example gelpac – others of a similar size would serve as well. Salivary Cortisol Enzyme Immunoassay Kit Salimetrics, LLC. I-3002 If assaying will not be conducted in-house, only collection supplies below are needed. Sinha, R., Garcia, M., Paliwal, P., Kreek, M. J., Rounsaville, B. J. Stress-Induced Cocaine Craving and Hypothalamic-Pituitary-Adrenal Responses Are Predictive of Cocaine Relapse Outcomes. Arch. Gen. Psychiatry. 63, (3), 324-331 (2006). Dias-Ferreira, E., et al. Chronic stress causes frontostriatal reorganization and affects decision-making. Science. 325, 621-625 (2009). Schwabe, L., Wolf, O. T. Stress-induced modulation of instrumental behavior: from goal-directed to habitual control of action. Behav. Brain Res. 219, 321-328 (2011). Lovallo, W. The cold pressor test and autonomic function: a review and integration. Psychophysiology. 12, 268-282 (1975). Ulrich-Lai, Y. M., Herman, J. P. Neural regulation of endocrine and autonomic stress responses. Nat. Rev. Neurosci. 10, 397-409 (2009). Cannon, W. B. Bodily changes in pain, hunger, fear, and rage: An account of recent researches into the function of emotional excitement. D. Appleton and Company. New York and London. (1915). Lupien, S. J., Maheu, F., Tu, M., Fiocco, A., Schramek, T. E. The effects of stress and stress hormones on human cognition: Implications for the field of brain and cognition. Brain Cogn. 65, 209-237 (2007). Herman, J. P., et al. Central mechanisms of stress integration: hierarchical circuitry controlling hypothalamo-pituitary-adrenocortical responsiveness. Front. Neuroendocrinol. 24, 151-180 (2003). Hines, E. A., Brown, G. E. A standard stimulus for measuring vasomotor reactions: Its application in the study of hypertension. Proc. Staff Meet. Mayo Clin. 7, 332-335 (1932). Loyke, H. F. Cold pressor test as a predictor of the severity of hypertension. South Med. J. 88, 300-304 (1995). Buchanan, T. W., Tranel, D., Adolphs, R. Impaired memory retrieval correlates with individual differences in cortisol response but not autonomic response. Learn. Mem. 13, 382-387 (2006). Duncko, R., Johnson, L., Merikangas, K., Grillon, C. Working memory performance after acute exposure to the cold pressor stress in healthy volunteers. Neurobiol. Learn. Mem. 91, 377-381 (2009). Cahill, L., Gorski, L., Le, K. Enhanced human memory consolidation with post-learning stress: interaction with the degree of arousal at encoding. Learn. Mem. 10, 270-274 (2003). Duncko, R., Cornwell, B., Cui, L., Merikangas, K. R., Grillon, C. Acute exposure to stress improves performance in trace eyeblink conditioning and spatial learning tasks in healthy men. Learn. Mem. 14, 329-335 (2007). Lighthall, N. R., et al. Gender differences in reward-related decision processing under stress. Soc. Cogn. Affect Neurosci. 7, 476-484 (2011). Schwabe, L., Wolf, O. T. Socially evaluated cold pressor stress after instrumental learning favors habits over goal-directed action. Psychoneuroendocrinology. 35, 977-986 (2010). Porcelli, A. J., Delgado, M. R. Acute stress modulates risk taking in financial decision making. Psychol. Sci. 20, 278-283 (2009). al'Absi, M., Petersen, K. L., Wittmers, L. E. Adrenocortical and hemodynamic predictors of pain perception in men and. 96, 197-204 (2002). Smeets, T., Otgaar, H., Candel, I., Wolf, O. T. True or false? Memory is differentially affected by stress-induced cortisol elevations and sympathetic activity at consolidation and retrieval. Psychoneuroendocrinology. 33, 1378-1386 (2008). McRae, A. L., et al. Stress reactivity: biological and subjective responses to the cold pressor and Trier Social stressors. Hum. Psychopharmacol. 21, 377-385 (2006). Kirschbaum, C., Pirke, K. M., Hellhammer, D. H. The 'Trier Social Stress Test'--a tool for investigating psychobiological stress responses in a laboratory setting. Neuropsychobiology. 28, 76-81 (1993). Kudielka, B. M., Hellhammer, D. H., Kirschbaum, C. Social neuroscience: Integrating biological and psychological explanations of social behavior. Guilford Press; US. 56-83 (2007). Dickerson, S. S., Kemeny, M. E. Acute stressors and cortisol responses: a theoretical integration and synthesis of laboratory research. Psychol. Bull. 130, 355-391 (2004). Schwabe, L., Haddad, L., Schachinger, H. HPA axis activation by a socially evaluated cold-pressor test. Psychoneuroendocrinology. 33, 890-895 (2008). Smeets, T., et al. Introducing the Maastricht Acute Stress Test (MAST): a quick and noninvasive approach to elicit robust autonomic and glucocorticoid stress responses. Psychoneuroendocrinology. 37, 1998-2008 (2012). Huettel, S. A., Song, A. W., McCarthy, G. Functional Magnetic Resonance Imaging.. Sinauer Associates, Inc. (2008). Porcelli, A. J., Lewis, A. H., Delgado, M. R. Acute stress influences neural circuits of reward processing. Front. Neurosci. 6, 157 (2012). Pruessner, J. C., Kirschbaum, C., Meinlschmid, G., Hellhammer, D. H. Two formulas for computation of the area under the curve represent measures of total hormone concentration versus time-dependent change. Psychoneuroendocrinology. 28, 916-931 (2003). Porcelli, A. J. Acute stress influences financial decision making. In M. Mather (Chair). How stress alters decision making. Symposium conducted at the meeting of the Assoc. Psychol. Sci. Boston, MA. (2010). Levey, A. B. Techniques in Psychophysiology.. Martin & P.H. Venables. Wiley. 597-628 (1980). Mitchell, L. A., MacDonald, R. A., Brodie, E. E. Temperature and the cold pressor test. J. Pain. 5, 233-237 (2004).